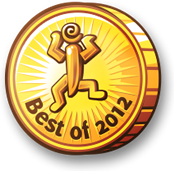 As this website’s official Announcement Fox, I am pleased to announce that The Fabulous Screech and The Sea Will Claim Everything have both taken first place in their respective categories in the Best of Casual Gameplay 2012 awards. This makes me happy, and makes up for the fact that Jonas is being a lazy bum (or sick with a jaw problem, if you want to use different words) and hasn’t posted the new Wanderers’ Tale yet. But still! Awards! Isn’t this nice? I’d tell you that Screech is really happy and grateful, but ever since his show won the Katsouli’s Choice award a couple of years ago he considers all human praise to be beneath his notice. You know how cats are.